Scott Willis for WAER: History has been made at a 107-year-old apple orchard in Lafayette that teamed up with a drone technology company to help do what nature sometimes can’t. 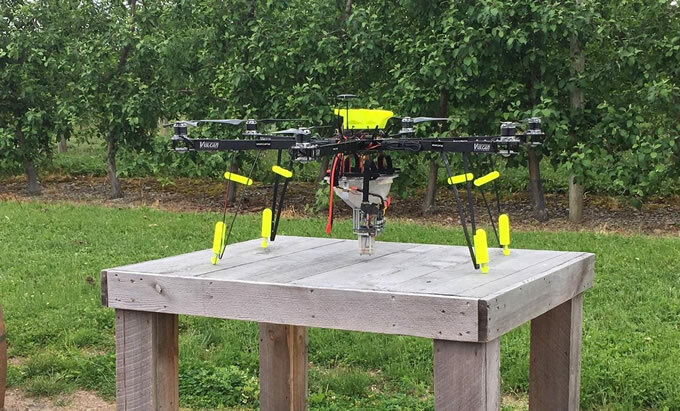 The pilot project is apparently the first time in the U.S. and maybe even the world that apple blossoms have been pollinated by drone. It goes without saying that agriculture is heavily dependent on the weather, and nature. So when Beak and Skiff partner Peter Fleckenstein heard of a way to eliminate some of that uncertainty, he jumped at the chance. "One less weather related event that I have to worry about every spring is are we going to have good bee work, is it going to be good bee weather." He says Central New York’s fickle spring weather can mean short four-day window for the bees to do their work if it’s warm and sunny, like it was about two weeks ago when the blossoms opened. That window can be as long as two weeks if it’s cool and damp… but that means the bees might stay home. "It's that small window. If you're in full bloom and you don't have good bee activity, what else can you do to make sure you have apples like this?" Fleckenstein said, referring to branches full of apple buds.